Maybe somewhere, but there’s a bunch of snow in my yard right now and my dog’s water bowl was frozen solid this morning. Yesterday we had blizzard conditions for most of the state, but less than 24 hours earlier it was 74 degrees and sunny. If states were given zodiac signs, colorful Colorado would surely be a gemini – dual-natured, complex, and contradictory. Or schizophrenic, however you want to look at it. March signifies the arrival of spring, but it’s also our snowiest month. I do like the snow and I’m not complaining, but my list of seasonal foods for March reads more like a tropical vacation than a winter wonderland. Life is interesting, isn’t it? Even if you walk into the market wearing a down parka and snow boots, the fresh pineapples, kiwis, and mangos are the harbingers of the harvest (and weather) to come. Yippee! A diet rich in colorful fresh fruits and veggies lends itself to optimal health, so add the following to your shopping list and reap the benefits. Pineapple – sweet and zippy! Although they’re available year round, this is the start of the actual season (March – June). Fresh is best and they aren’t that expensive right now, so skip the canned stuff and go for the real thing. Pineapple contains an enzyme called bromelain, which is a natural anti-inflammatory agent, digestive aid, and immune booster. This fruit is also an excellent source of vitamin C and manganese. Kiwi – these little fruits look as good as they taste. The emerald green color and tiny black speckles make for a luscious addition to a fruit salad, not to mention you get almost 100% of your daily vitamin C needs from one kiwi. And how hard is it to eat one kiwi? They also contain potassium, fiber, magnesium, and vitamin E.
Mangos – mangos are another fruit full of healing enzymes. They’re also a good source of vitamins A and C and they’re high in fiber and rich in potassium. The enzymes in mangos aid digestion and help us break down our food – and most of us can probably use the help! Mango trees are evergreens (wow, who knew) and are known to grow 60 feet tall. Bananas – yes, another tropical fruit! Bananas are full of potassium, which helps control blood pressure and protects against atherosclerosis. They’re also a good source of vitamin C, vitamin B6, magnesium, and they aid digestion and soothe the stomach lining. Figs – figs have been part of the diet for a very long time. Just ask Eve, she ate the first fig then fashioned a bikini out of leaves. Smart girl. Although they’re in season right now somewhere in the Mediterranean, they actually aren’t in season until June in California, but dried figs are available all year and they make a good treat if you want something sweet and chewy. Yum! They’re also high in fiber and contain a good amount of potassium. Cauliflower – this cruciferous veggie is rich in all kinds of health-promoting substances. It’s high in vitamin C, vitamin K, fiber, and folic acid and studies show it contains substances that may protect against cancer. I love it steamed and whipped like mashed potatoes – that way it doesn’t taste so, so, cauliflowerish. Leeks – yikes, scallions on steroids! Garlic, onions, scallions, shallots and leeks all belong in the same family and all contain similar protective substances that have been shown to reduce cholesterol and raise HDL levels. Research shows these veggies also lower blood pressure and protect against heart attack and stroke. Leeks add a nice subtle flavor to soups, stews, and stir fries. This entry was posted on Monday, March 3rd, 2008 at 3:10 pm	and is filed under Seasonal Foods. You can follow any responses to this entry through the RSS 2.0 feed. You can leave a response, or trackback from your own site. Great stuff, yet again! I have a thing for roasted cauliflower (I posted about it a while back) — I tend to eat a whole head in one sitting. It’s weird, but at least I’m getting some vitamin C out of it! My daughter made a gluten free quiche for her beau and brought me one, it was great. I know she will learn alot from your site as she learns to cook gluten free. Thanks for the colored foods list, will add more to my diet. It’s getting warm here in Charleston, had the AC on today!!! I checked out anotheroutspokenfemale’s (I suppose we’re all in that category) blog and yes, you do have some good recipes, biting humor, and nice information! Thanks for the tip-off! Cindy, I’m sort of with Jon on the cauliflower. It’s okay, but not my favorite – but it’s so full of good things that I keep trying different ways to prepare it so it doesn’t overwhelm me with its cruciferousness. Yeah, if I had to choose between a chunk of fresh pineapple and a chunk of cauliflower, it wouldn’t take me a nano-second to decide! 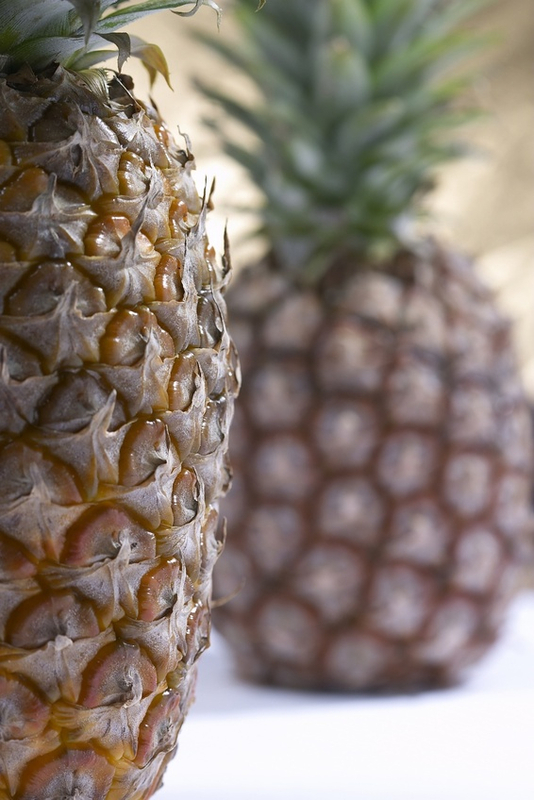 Yes, Lizzie – the enzymes in pineapple are awesome for a variety of reasons! Kim – oh, yum! Post the recipe on your wonderful blog (http://goodfoodjustgotbetter.com/). Dee – I couldn’t agree more. We have a world of abundance at our fingertips. Dig in! Hi Melissa – I really am thrilled that your comment has led me back to your blog. Gluten-free…not quite, no allergies here, but we certainly don’t want any! What’s your favourite grain to cook with? Thanks for the encouragement! Give me about 2 weeks and I will do a post on the Quiche, as I must confess I ate the whole thing by myself and need to………….not eat so much for two weeks. For those that stopped by my site today and read the cook, forgive me I posted the wrong page, so visit again as the new Cook is more friendly,upbeat, funny and not so cranky!!! !